I'm really disappointed with SNK NEO GEO mini creation. Not that (cute?) Japanese red-white-blue version. Apparently it's a reality in Japan. But that dull gray version that is prepared for "international" market. OMG! Tragic! What an ugly piece of... plastic! and see my mockup of red MVS version cabinet. Anyways... below you can find my imagined interface/launcher for this non-existing red version. It's little cramped - but remember, it's 3,5" screen. This is a preview of an upcoming CARBONITE theme - the first AM theme with fully fledged 3D coverflow game selector. We are working on this theme with ArcadeBliss that handles all of the coding. And a big round of applause for him - because this is a year old concept that was gathering dust because I wasn't able to code it. And what's more exciting - it's not a one-off project. ArcadeBliss is making this as a fully functional and user-configurable AM module. Yay! The screen below is more of a mood board for the overall design. But the coverflow part is already coded and functional, so we are at least halfway through. This is a new MAGNUS theme with coverflow launcher. Take a sneak peek at the new theme that we are creating together with liquid8d (coding). Prepare for really awesome features like cover flow selector and beautifully presented game artwork. 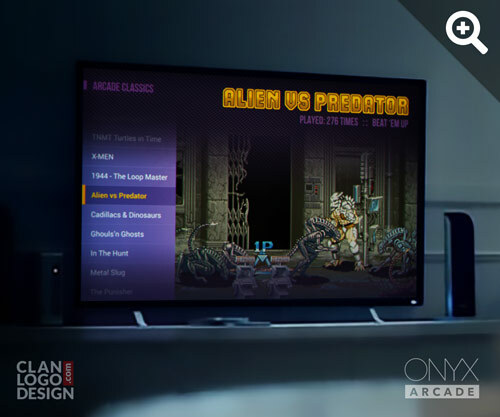 The whole UI is made in 4K res - so your new big and shiny TV will be thrilled. It's of course down-scalable to lower resolutions. I think we are halfway through - but no ETA (as usual). Tell us what do you think. Scripting / MOVED: Critique this layout? UPDATE: Video with full set here. For the FLAT BLUE theme I've started to test game icons. On the left - menu icons created automatically from game snaps. On the right - actual game icons (created by MAMu). All icons are in low res (32x32px) and this looks too blurry and pixelated on hi-res screens. But after applying a set of transformations/overlays/filters in Photoshop it starts to look good enough (or not?). It's done "by hand" for these 2 icons, but I'm sure I can script a set of commands/transformations in Photoshop to get similar effect and batch convert all 10k+ icons. You can see hi-res version here. This is a sneak-peak of a concept I'm working on. The main idea is to create cool-looking tiles from game snapshots or videos. The tile is made from 3 elements: overlay, wheel graphics (game name), and underlying snapshot (or video). All the shadows/reflections/glow are static PNG overlays so it should be realtively easy to code and can be used in 2D grid or in coverflow-like slideshow. Screen layout is just a quick sketch to show the tiles in action - it's more about the tiles design itself. See the bonus feature at the end of the video - you can change the colour of a whole theme - via layout settings. This way you can pick you favourite colour - or assign particular colour to emulator. Like - red for MVS NEO GEO. It's still a minimal front-end theme - using just a text and a single snapshot (or gameplay video). For the people that don't have all that artwork and don't want to hunt it down (or don't care). Here is a sneak peek of a new project. This is a minimal front-end theme - using just a text and a single snapshot (or gameplay video). It's for the players that really don't care about all that artworks - just want to fire up AM, select the game and play! And it is an easy solution for gaming platforms other than MAME - because even if there is no way to scrap/download screenshot via AM - you can always make a screenshot and call it a day. I've decided to name this theme VELVET. PURPLE RAIN (thanks omegaman) is great too - but VELVET seems to be more versatile... and Prince wore velvet suits so... it's in more-or-less the same realm. What's best? Maybe you'll have a better name? THE EYE development re-started! Yay! My weak coding skills are no longer an issue - because it will be coded by ArcadeBliss. Currently we have a working prototype with a key features and testing a few new ideas. Scripting / [help] how to determine if snap is horizontal or vertical? how to determine if snap (or any other art) for current game is horizontal or vertical? I would like to position and scale snap in background differently for vertical and for horizontal snaps - totally different set of coordinates. I'm sure that not everyone is reading rather lengty thread about my NEVATO theme. So I'm reposting this as a separate thread. This is my concept for emulator marquee art for this theme. Of course when it will be released - you can use it with any AM theme. Please keep in mind that I'm not using any emulators other than MAME. Scripting / what's the standard size of a marquee? Well... I know that there is no standard (one golden aspect/size), but what's the most common size of a marquee? google came up with 2 sizes 8x23" and 8x26"
I went through my marquees and most (2/3rd) of them are 8x26", but I have only 150 games and mostly more "modern" titles and I don't know if this is a coincidence or 8x26" marquees are more common. Maybe I'm too picky - but scrapped marquees are not that great (quality wise, scrapping mechanism on its own - is a godsend!). Faded colours, bad scans, etc. So I end up fixing almost every marquee that I wanted to use - or even making them from scratch. So it got me thinking that I might be better spending that time actually "creating" something instead of "re-creating". Scripting / [solved] how to force specific layout option list order? In my theme layout options are in "random" order. Well... at least not in the order that is coded in layout.nut file. Is there a way to force specific list order? A small thing, but this really drives me mad. I have three options regarding background - one is on 3rd position of the list, second is on 5th and third option is on 7th. I would like to provide a global switch via layout options that will mute video sound (for every video in layout). Below you will find my code. But when I try to make this happend via layout options - no go. I'll just add that I know that video sound can be disabled globally in AM (in SOUND options) - but I want it to be disabled for particular layout, not for all layouts.